Tankless water heaters, also known as on-demand water heaters, are quite popular with forward-thinking homeowners, and for good reason. A tankless water heater has no tank (you're welcome). Instead of slowly heating water in a tank and keeping the water in the tank hot, a tankless water heater only heats water that is needed and does so very quickly. Most tankless water heaters produced today are high-efficiency, direct-vent, powervent units. Also, while traditional tank water heaters are all very much alike, the same cannot be said for tankess water heaters. They're all very different, so I have to speak in generalities for this blog post. One obvious benefit to a tankless water heater is its smaller size. Instead of taking up a big chunk of floor space, tankless water heaters get mounted on a wall. Another huge benefit is an unlimited supply of hot water. You can take a five-hour shower and you'll never run out of hot water. If you have a hot tub, you could fill the whole thing with hot water and be ready to use it as soon as it's done filling with water. Arguably the biggest benefit offered by tankless water heaters is less energy consumption. Because there is no tank of heated water continually having to be kept hot, tankless water heaters don't experience the same standby energy losses that traditional tank water heaters do. How much less? The most efficient gas tankless water heater that I could find was a Bosch Greentherm 9900 series unit, with an energy factor of 1. According to the Energy Star website, this water heater will use 150 therms/year for natural gas. Most traditional tank-style water heaters will have an energy factor of about .67, and will use about 225 therms/year. Here in Minnesota, we currently pay about 52¢/therm for natural gas. That means a savings of nearly $40 / year at today's gas prices. Tankless water heaters also last longer, with warranties on heat exchangers typically in the 12-15 year range. Powervent water heaters typically come with a 6-year warranty, while traditional tank water heaters typically come with 6, 9, or 12-year warranties. The most obvious drawback to a tankless water heater is the higher cost for both the unit and the installation. Tankless water heaters cost more than traditional tank water heaters; typically about twice the price for the unit alone, depending on what flow rate is needed. They're also more difficult to install, as they have special venting requirements and often need larger gas lines because of the higher BTU rating. Of course, that means a higher price for installation. Even though tankless water heaters can deliver an unlimited amount of hot water, there's a limit to how much water can be delivered at once. Traditional water heaters can deliver as much hot water as the pipes will allow all at once. Tankless water heaters, on the other hand, need to heat water as it passes through. It's important to get a large enough tankless water heater to make sure that adequate hot water flow is available. In colder climates like ours with colder groundwater, smaller tankless water heaters will only deliver enough hot water for one shower at a time. As long as a large enough water heater is installed, it's not a problem. Tankless water heaters take longer to deliver hot water. Traditional water heaters have hot water sitting at the top of the tank ready to go. On a tankless unit, cold water enters the heat exchanger tubing and begins to be heated. All of the water sitting in the tubing that had cooled down since the unit last fired will be delivered to the fixture first. This makes tankless water heaters take longer to deliver hot water. One solution to the long wait is to install a small tank water heater after the tankless water heater to act as a tempering tank, but once you do that, it's no longer a truly tankless system. 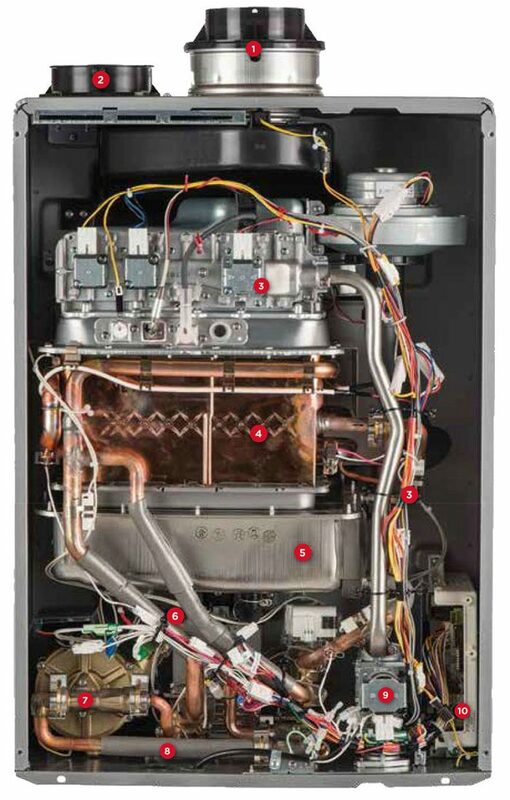 There are also on-demand hybrid water heaters available, such as the Rinnai hybrid unit shown at right. Again, this is no longer a tankless water heater, however. Another solution is to install a circulation system to make hot water available during peak periods of the day. Because of the way that tankless water heaters heat water, you can often end up with a slug of cold water when hot water is turned on, off, then on again. This is called a cold water sandwich, and it isn't something that happens with traditional tank water heaters. One of the biggest and least talked about drawbacks to tankless water heaters is that hard water destroys them. Malfunctions caused by lime, mineral build-up, or scale are not covered by manufacturers warranties. For example, the Takagi installation manual says that water hardness levels must not exceed 7 grains per gallon. Most cities here in the Twin Cities area have much harder water than that: see Water Hardness List for Twin Cities. Hard water is hard on all water heaters, but it's especially hard on tankless units. I spoke with a technician who has seen tankless water heaters fail due to hard water deposits in as little as two years here in Minnesota. To help prevent an early death, tankless water heaters must be flushed regularly. The video below describes this as a "simple process", but take a look and decide for yourself if this is simple. Tankless water heaters are also supposed to be drained and the filters cleaned every month. Low Flow = no hot water. Tankless water heaters require a certain flow rate to activate the water heater and to keep it running. For example, some units will only operate when there is 1/2 gallon per minute of water flow. I've heard this can be a major problem in older houses with galvanized water pipes that aren't even capable of delivering 1/2 gallon per minute of flow. The next time I need to replace my own water heater, I'll probably stick with my standard tank. The increased cost and the increased potential for problems simply doesn't outweigh the added benefits for me. 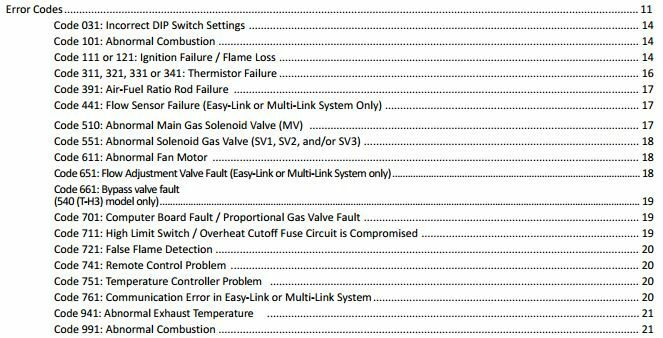 If I ever decide to install a tankless water heater, I'll probably spend a long time reading over all of the specifics of the particular model that I choose. Besides sizing the unit appropriately, I'll want to know what the manufacturer's minimum flow rate is, what type of water quality is required by the manufacturer, and exactly what the warranty covers.